Don’t Cut This Mustard . . . The initial attraction to the world of wild plants often comes from the edible angle. Dandelion leaves for salad, onion grass for spice, and chickory root for a coffee substitute are just a few of the culinary oddities that can cultivate a lifetime of interest in the folksy home remedy, the locally-grown green, the weed as wildflower. The Shepherd’s Purse (Capsella bursa-pastoris) stands in the forefront of this group. An immigrant from Eastern Europe and Asia Minor, the plant offers a variety of uses. The leaves are both edible as a green and medicinal as a blood-clotting agent. The seeds, which have a flavor akin to pepper, can be used as a spice and are commonly used in Chinese won tons. This member of the family Brassicaceae, the mustards, is also one of the most visually striking wild plants to be seen growing along the margins of the West Village. 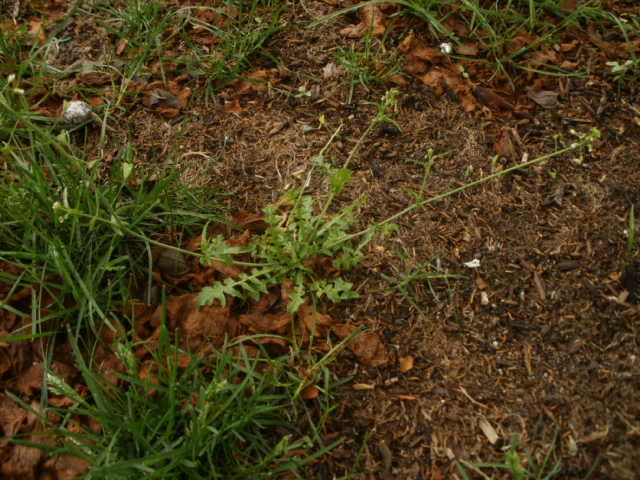 A basal rosette of toothed leaves similiar to the dandelion send up stalks fringed with seed pods topped by racemes of florets, each one consisting of four tiny white petals. The seed pods below the flowering head are the most beautiful feature of the plant. Close up, they appear like tiny creased hearts served on a stem. These wind up the flower stalk in a symmetrical spiral manner that conjurs up a sense of movement. A loose group of shepherd’s purse plants, viewed with a little imagination, resemble whirling dancers. Anyone who has access to an online search engine will learn the pods are the source of Capsella bursa-pastoris’ popular name. Apparently the shepherds of medieval times carried a pouch that paralleled the design of this seed-bearing structure. The Latin name alludes to the capsules bursting and spreading their contents in a pasture; an image as poetic and pretty as the plant itself. 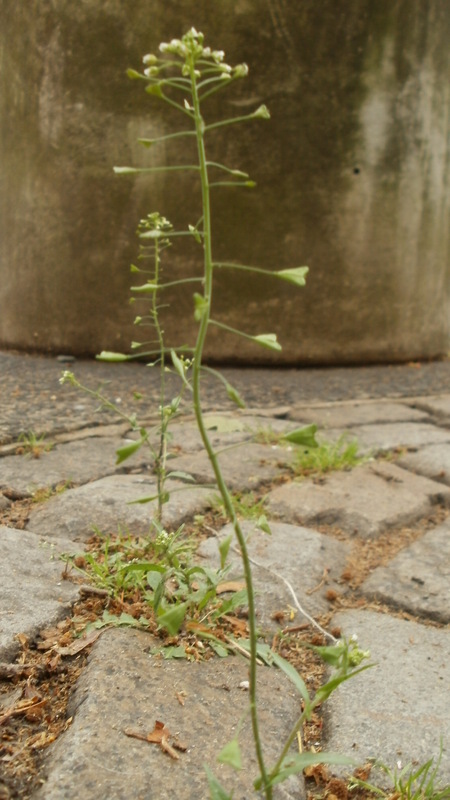 Shepherd’s purse is a ruderal, one of the first plants to return to an area of soil disturbed, for example, by construction. For all of its useful qualities, and for all of its poetic lines and grace, it is also physically tough and once rooted will resist a lawn mower nine times out of ten. 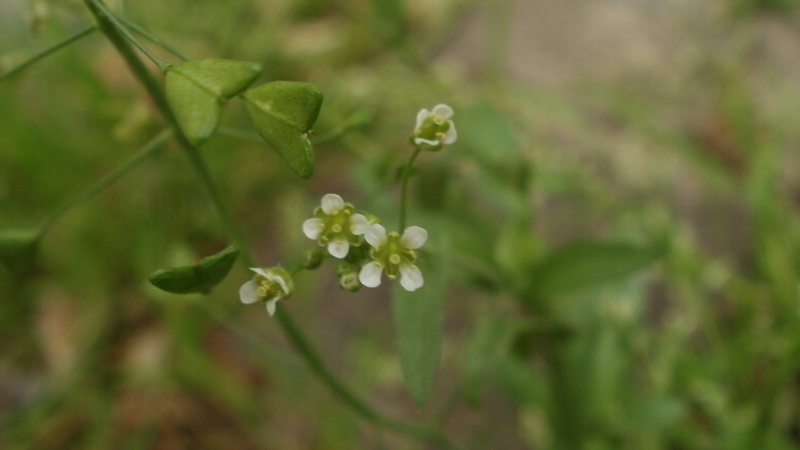 Edible, medicinal, and attractive, the shepherd’s purse is one of the West Village’s weeds most qualified to be viewed instead as a wildflower. So, don’t cut this mustard!